Meet Six-Leg. He’s an adventurous spider who lives in a dustbin. In Trifle of Trouble, Six-Leg finds himself in a very sticky situation. But can an unexpected new friend help him get out of it? The Adventures of Six-Leg Spider – Trifle of Trouble is now available on Kindle, Kobo and iBooks. A lover of animals and the great outdoors, Fiona Love shares a beautiful period flat on the outskirts of Manchester with her lovely boyfriend Frank and his various techno gadgets! Fiona is passionate about the power of the written word and how stories can light up the imagination. She believes a great narrative can help children, even very young ones, learn about language, values and skills to help them navigate their journey through childhood and onwards to become well-rounded, caring adults. Following the recent birth of her nephew, Fiona decided to dust out the corners of her own imagination and rekindle a story that first came to her as a twelve-year-old. All of a sudden, Six-Leg the spider was back, weaving his way across her notebook, in his very first adventure Trifle of Trouble. 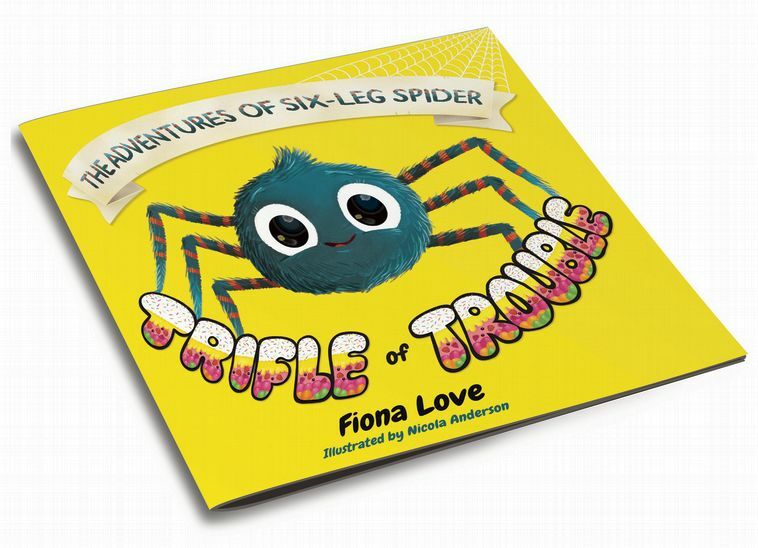 Six-Leg the spider is inquisitive, funny and brave, and also very kind, patient and considerate – exactly how Fiona thinks little spiders, and little people, should be!